Chris Dozer, who’s father to one of my 10yo online lesson students, sent the following Wall Street Journal article titled: “Watching Your Weight Before Hitting Plate”. 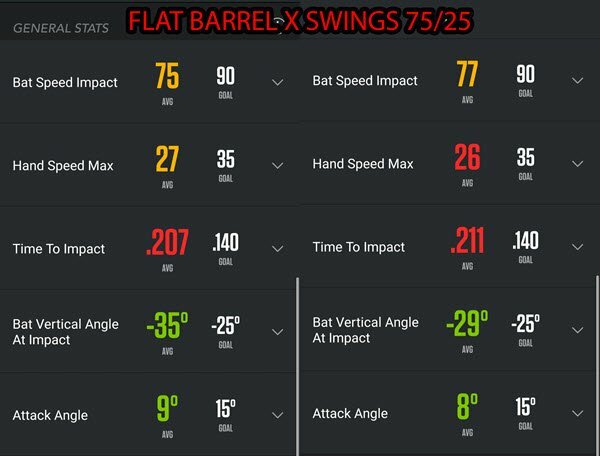 According to the Zepp app, average professional bat speeds range from 75 to 90-mph, average High School and College bat speeds range from 65 to 80-mph, and average youth bat speeds range from 40 to 70-mph. Dr. DeRenne, found using a 28-ounce batting weight changed the balance point of the bat and slowed down bat speed. 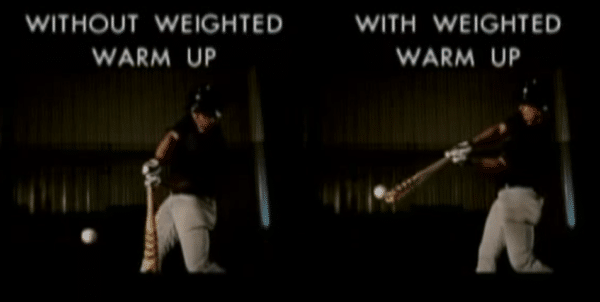 In Sports Science video above, a college hitter in 2008 hit 10 machine pitched balls WITHOUT using a batting weight before, and had an average bat speed of 69-mph, and routinely connected with the sweet spot. After using the batting weight, then taking another 10 swings off the same pitching machine, his average bat speed dropped to 68.3-mph, and on each swing he missed the bat’s sweet spot by several inches. The above video talked about how because the hitter swings the bat at a slower pace using a batting weight, more red slow twitch endurance muscle fibers get recruited, thereby decreasing the amount of white fast twitch muscle fibers which fire two to three times faster. 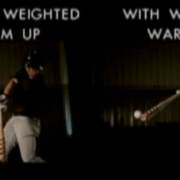 Warming up with batting weight in on-deck circle is actually priming the wrong muscles before stepping in the box. The experience of a single batter can’t be generalized to others, but the results resembled other studies. So, not only are hitters losing bat speed using a batting weight on the on-deck circle, but by barreling up the ball LESS OFTEN, they’re losing batted ball distance as well. 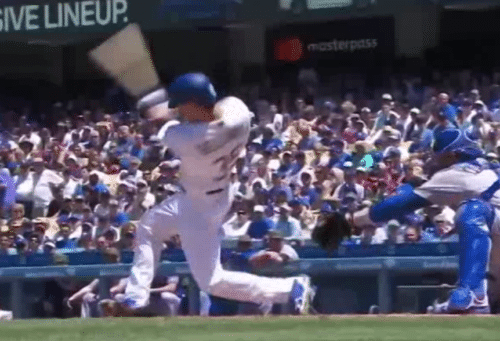 Aside from swinging the hitter’s own bat, I’d say swinging a lighter bat – faster – would help the body recruit more of those white fast twitch muscle fibers before stepping in the box. 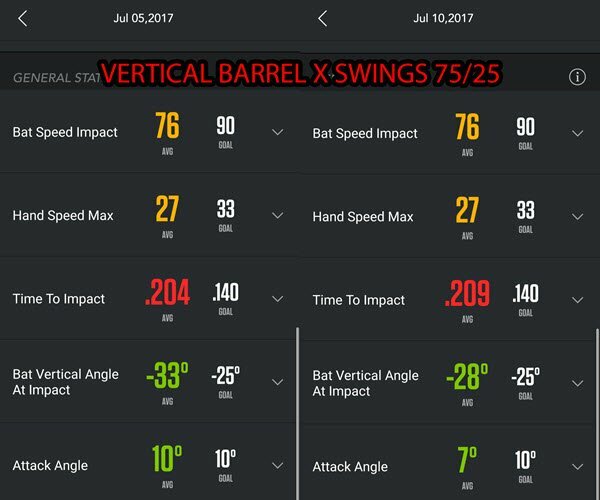 https://hittingperformancelab.com/wp-content/uploads/2017/06/weighted-bat-warmup-studies-e1496862691995.png 302 600 Joey Myers https://hittingperformancelab.com/wp-content/uploads/2018/05/hitting-performance-labs_c90c0362088ef1d3d528f3078f4f8ac1.png Joey Myers2017-06-08 04:07:082018-05-17 18:05:48Using Batting Weight On-Deck May Dangerous To Bat & Ball Exit Speed? 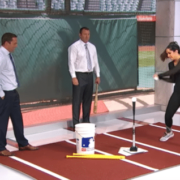 Some hitting coaches still think the baseball and softball swing are drastically different. 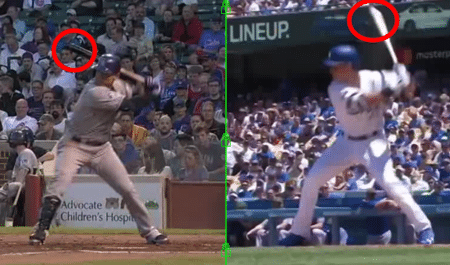 But there’s virtually zero difference in explosive human movement when the swing objective is hit the ball as hard as you can, as far as you can…consistently. 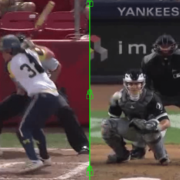 In this video analysis, I wanted to compare the swings of Sierra Romero and Aaron Judge. Don’t worry if you don’t know one or the other…you will by the end of this post. Kidding aside, and in my opinion, more baseball players can learn A LOT by watching Sierra Romero swing the bat than any Big Leaguer. It’s a bold thing to say, but it’s true. Sierra finished her rookie professional Fast-Pitch Softball season batting .339 in 109 at-bats with 18 runs scored, 37 hits, 4 doubles, 2 triples, 5 HR, 21 RBI and a .397 OBP. First player in NCAA softball history (at Uni of Michigan) to record 300 runs, 300 hits and 300 RBI in her career. Owns NCAA record in career runs (300) and grand slams (11). Ranks fourth all-time in career RBI (305) and slugging percentage (.882) and eighth in home runs (82) and walks (225). Joined the USA Junior Women’s National Team (2012), ISF Junior Women’s World Championship Silver Medalist (2012). Was a three sport athlete in High School (Football, Basketball, and Baseball). Played at my Alma-mater, Fresno State, from 2010 and got drafted by the Yankees 32nd overall by the Yankees in 2013. As of April 2017 Exit Velocity metrics, Judge clocked game batted balls of at least 115-mph SIX TIMES!! Joey Gallo was second with two. Did I mention this guy is a BEAST?! 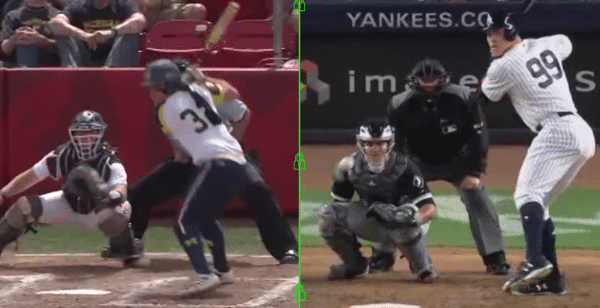 In comparing the swings of Sierra Romero and Aaron Judge, there are many BIG WIN mechanical similarities. They both hit for power and precision. 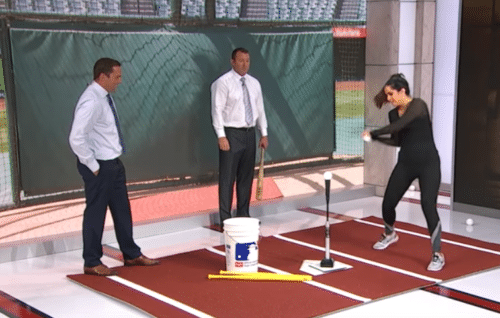 The softball swing isn’t any different than its baseball counterpart. Power and precision don’t have to be mutually exclusive. Size doesn’t matter, however if you’re a beast like Aaron Judge the capability of hitting the ball farther with consistently higher Ball Exit Speeds is greater. What is clear however, is if you move better, then you perform better. In the day and age of advanced technology and access to specific experts on human movement and Physics, there’s no room for coaches who resist getting educated. If you aren’t growing, then you’re dying. Yes, I’m releasing ANOTHER book!! AND YES, I’VE BEEN PULLING ALL-NIGHTERS, DRINKING LOTS AND LOTS OF CAFFEINE, AND LISTENING TO LOTS AND LOTS OF METALLICA TO WRITE THREE BOOKS IN 3 MONTHS!! What I want for you to do is get this book and give it away as a gift. Ideally to a coach who teaches their hitters to produce a lot of “worm-burners”, but one who may also be open to being persuaded from that unfounded malarkey. On sale, The UGLY Truth paperback will be $9.95, and the Kindle version will be $2.99. And by the way, you don’t have to own a Kindle to read a “Kindle-version” ebook. Just download the Kindle app on any mobile device, and BOOYA! You can access it. You may be thinking what I teach my hitters to do since I don’t want them hitting ground-balls. I very much agree with the Backspin Tee guys’ motto of ‘On Path of the Pitch, Bottom Half of the Ball’. But how do you put that into practice? How humans change directions and planes of motion. Watch them run these routes from a big picture point of view. In other words, not looking for any specific arm or leg angles. Watch them ‘get lower’ when changing directions, or cutting. They land on a bent plant leg, then push off the same leg, extending it, to accelerate again. Transverse (a.k.a. 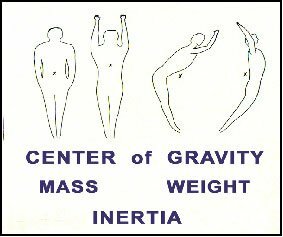 twisting motion) – is an imaginary plane that divides the body into superior and inferior parts. It is perpendicular to the coronal and sagittal planes. In changing from one plane of motion to the other, to be effective, there MUST be a ‘getting shorter’ of the body’s stature, as the athlete plants and pushes off the ground to change directions. The wide receivers from the video are changing from the Sagittal (front to back) to Frontal (side to side) Planes. 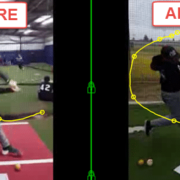 While a hitter changes from the Frontal (side to side) to Transverse (twisting) Planes. In other words, just like an NFL wide receiver goes from a bent plant leg to straight at push off, a hitter MUST go from a bent landing leg, to a straight leg at ‘push off’. Homer Kelly’s statement has as much to do with hitting as it does with the golf swing! During the Final Turn, a hitter like Adrian Beltre uses his flexed back knee (and straightened front one) to slant his pelvis up towards the downward traveling pitch, and as a result, keeps his head motionless during the Final Turn. Early head movement, pre-stride landing, is okay. Late head movement is not. Think of the back leg angle as angling your body like a “ramp”. 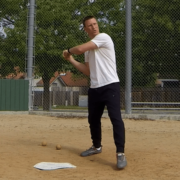 CLICK HERE for a great drill for getting hitters at a better “ramp” angle. I did another swing experiment looking at the difference in bat speed at impact between ‘squishing the bug’ with the back foot and not squishing the bug…basically letting the back foot skip. 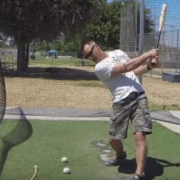 What was the results of the 200 swing experiment? What does this mean? That ‘squishing the bug’ is an inferior hitting mechanic. Not ALL elite hitters “skip” the back foot, but most do “un-weight” it. I just like teaching my hitters a minimal skip to make sure they’re shifting center mass into impact, behind the front leg. I read somewhere that Bryce Harper shifts 150% of his body-weight into impact (skipping his back foot), whereas if he just “squished the bug”, he’d only shift 75% of it. That’s a HUGE difference! 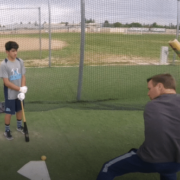 I recently did a video blog post case study featuring one of my 15 year old baseball players Liam titled, “Taking The Headache Out Of Teaching Barrel Path”. We used the Ropebat to change his “Verizon check mark” barrel path into a “Nike Swoosh” sign. Why one over the other? I want my hitters to build proper bat lag into their swing, or an early barrel on the plane of the pitch. This helps the hitter barrel the ball more often when their timing may be late. *Results aren’t typical. Liam has a primary “feel” learning style, so the Ropebat worked well for him – and not to mention quickly with minimal use. The benefit of keeping the barrel on the plane of the pitch longer is to help the hitter when their timing is early, especially on off-speed and breaking balls. 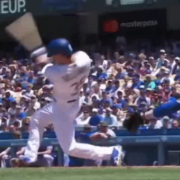 I typically refer to this as the Power-V, however the V-position of the arms MUST happen AFTER impact. It shouldn’t be a goal to get the hitter to Power-V at impact. The latter would put hitters at a disadvantage to inside and higher pitches in the zone. Increase Batting Average on Balls in Play (BABIP) – you’ll learn how tweaking two simple things can super-charge batted ball distance, which means seeing the backs of outfielders, and not the front! 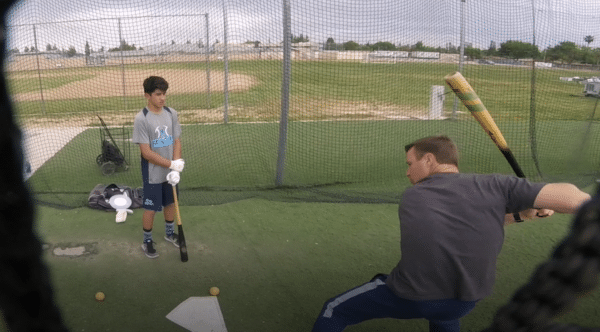 Reduce Strikeouts (K%) – you’ll discover how to conquer the root cause of striking out and mis-hits, and see coach get excited each time your hitter gets up! Increase Repeatable Power (OPS) – soak up this one human movement rule and you’ll be a pitcher’s worst nightmare. The pitcher would be better off, stepping off the mound and throwing the ball in gap! Get More Consistent Multi-Hit Games – getting 3, 4, and 5-hits in a game is not magic. When all four steps are achieved it makes multi-hit games doable! 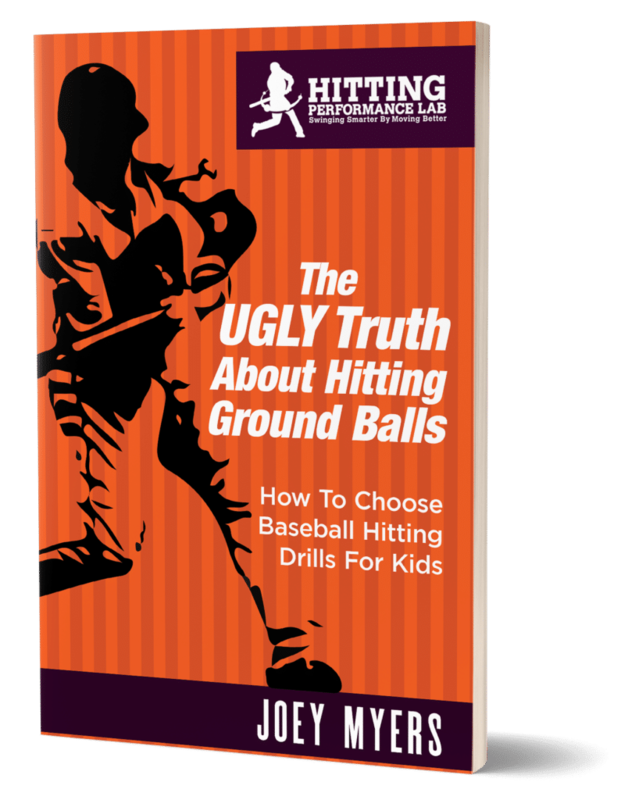 Please order the book today – we’re in a position to add gasoline to this movement to banish hitting ground-balls for good!! 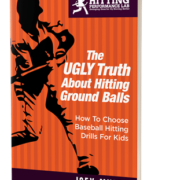 Outside of situational hitting of course 😉 Join the movement and order: The UGLY Truth About Hitting Ground-Balls: How To Choose Baseball Hitting Drills For Kids on Amazon today. There are 10-days between these two videos. He had what I’ve heard called a Verizon check mark barrel path BEFORE. We worked on smoothing out the check mark into more of a curved Nike Swoosh barrel path. The RopeBat cues I use in conjunction with the “feel” of the Ropebat. 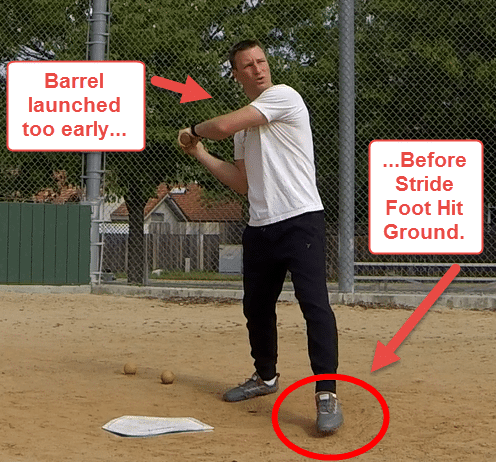 CLICK HERE for the original full Ropebat post I did awhile back that shows the swing drill we used. I use the Ropebat quite often for my hitters that need to fix the same issue Liam had. It works. You can order the RopeBat at my store TheStartingLineupStore.com by CLICKING HERE, or on Amazon by CLICKING HERE.